This remarkable laundry, carpet and upholstery stain treatment removes organic based stains caused by wine, blood, soil, grass, mold, food, vomit, feces, urine, and perspiration. Utilizing the power of natural enzymes, it breaks down and deodorizes organic matter as it cleans, leaving a fresh peppermint scent. Shake just before use to energize the enzymes. Stains and severe odors: Apply directly to odor source or stain after removing encrusted matter and solids. Let stand for 15 to 45 minutes. Scrub with a white rag or soft brush. Blot with a white towel. Rinse if desired. Drains, grease traps, bowls & urinals: Use 4 oz. per fixture weekly to eliminate odors and build-ups. Keeps drains free running and odor free. Laundry pre-spotter: Mix with 1 to 10 parts water and apply directly to spots and stains 15 to 45 minutes before washing. Deodorizing garbage cans/dumpsters: Mix with 3 parts water and apply to source of odor. Natural Enzymes, Non-Ionic Surfactant (naturally derived detergent in an ethanol derivative), Peppermint Oil, Propylene Glycol, Ozone Treated Water (for purification). Contains no preservatives. 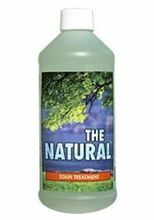 "The Natural Stain Treatment works wonders and has made my life so much easier. It's removed difficult stains from my clothes and red wine from my carpet - and even my car's upholstery came back to life after a cleaning with The Natural Stain Treatment in water. Thanks for developing this product." "The staff had high marks for this product which completely removed organic stains and all trace odors from carpet and upholstered furniture without emitting any noxious fumes or leaving any residues. No other product performed all of these tasks better." * Free of petroleum distillates, butyl ether, ammonia, chlorine, phosphates, benzene, pine oil, or strong acids. Keep out of reach of children. Not for internal consumption. Avoid contact with eyes. In case of contact, flush thoroughly with water.